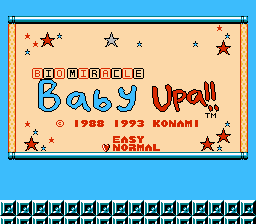 Romhacking.net - Translations - Bio Miracle Baby Upa!! And your weapon? A rattle. Honestly, your baby character isn’t very Bio Miraculous, but your rattle is pretty kickass. You can whack a monster with it and it’ll get big and float away. Then you can jump on top of it and ride on top of it for a little while. 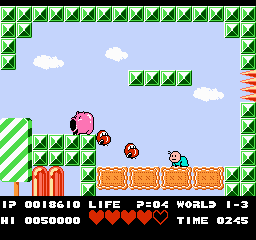 Or, you can jump into it, and it’ll fly off and hit other enemies. This is how you get rid of the bosses. Pretty clever! 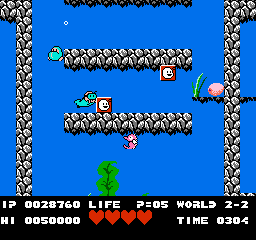 They try and mix it up with a SMB2-style digging level (think World 2/World 6) and a swimming level and stuff, but it just gets annoying. The game proper is a lot of fun, though. 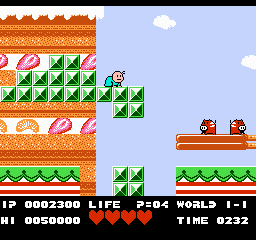 All the game needed was a title screen hack. So here ya go. Could’ve been better though.